1.5 years ago FPC started with the worlwide deployment of the webbased application PackAssist within the logistics and returns/repair supply chain at Philips Healthcare. By answering a simple and user friendly registration questionnaire in PackAssist more than 4.000 improvement proposals were submitted by employees coming from all levels of the organization. These proposals result mainly in less voluminous, but still qualitatively good packaging. In other words, the air is taken from the packaging! A sample taken at random showed that when an expert would look at the proposals as described before, Philips would save at least € 1.000.000,- on transport costs annually. This simply by removing the redundant air from the packaging. On request of Philips, FPC started working on this subject, of course with help of the PackAssist software. A recent “big data” analysis demonstrated that the amount of cost saving can increase up to more than € 8 million in the future. From the cost perspective this is a very positive development, and don’t forget the decrease in CO2 emissions. Unique in the combination of PackAssist and the expert advice of FPC is the fact that the changes are directly in place. 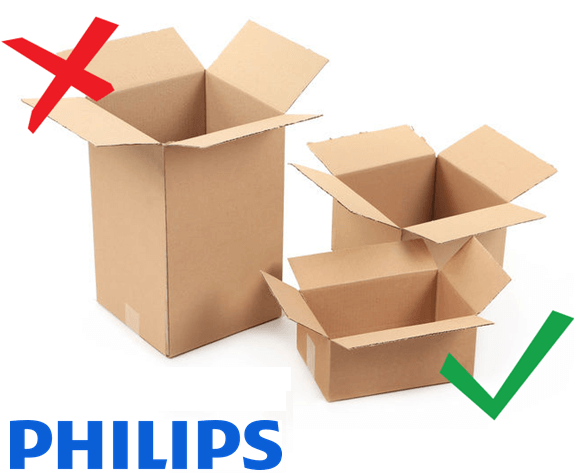 Because of this Philips can immediately benefit from the improvements without slow and difficult change procedures, while making sure everything is being secured adequately. Plans have already been made to implement a more efficient range of packaging materials to further increase the current cost savings. By combining a big data analysis of fast movers and PackAssist data, the experts of FPC can determine the ideal mix of packaging materials that matches the order flow of the customer. The expectation is that the additional annual cost saving will be 1 to 4 million Euro. Of course not only Philips has these kind of problems. Inefficiencies in supply chain processes cause similar issues at a lot of companies. 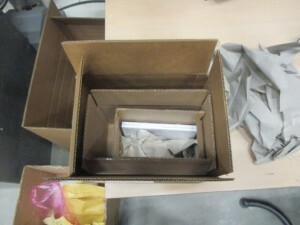 A familiar example is this picture, where a CD is packed in 3 boxes, while it could have been packed and send in a bubble envelope without any problem. This may appear to be a very extreme example, but this kind of suboptimal packaging is no exception at all. This is not only a waste of packaging but also impacts your transport costs. Do you also want to save on transport costs by implementing volume reduction?